This all in compassing hike begins at the trail head on Forest Road #5401. The trail is fairly level for the first 3/4 miles then after reaching the junction of Trail #132, you begin a steady climb. You will follow this trail all the way to the backside of Observation Peak where you will then rejoin Trail #192. The first couple miles of this hike are through dense Old Growth forest and are a delight to walk among the giants. As the trail gains elevation the size of the trees decrease. 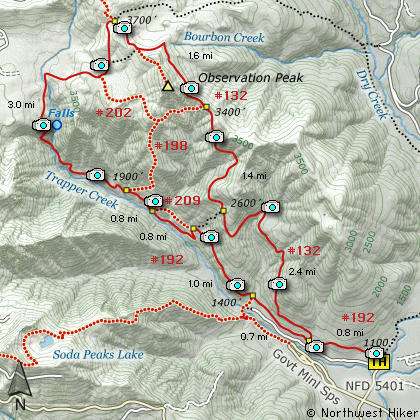 At about 2.5 miles you will have gained enough elevation that you begin to hike through occasional open ares thus affording you of excellent view of Soda Peaks and the Trapper Creek valley below. At about 3.5 miles you will come to a junction of Trail #198. Bear right and stay on Trail #132 as it cuts across the north side of Observation Peak. You will get additional glimpses of the distant mountains and valley along this part of the hike. The trail continues another mile before you come to the junction of Trail #132A, which is the route to the top of Observation Peak. In another half mile you will come to the junction of Trail #192. This is the same trail on which you began your hike. Follow this trail up and around a small hill then begin a steep descent into the Trapper Creek Valley. In about a mile and a half you will need to cross the creek. There should be a suitable log crossing above the small rapids. The trail now begins to descend steeper and steeper with each step. Finally switchbacks will ease the rate of descent. While working your way down into the Trapper Creek valley, you will come to an obvious place where you can leave the trail for just a few feet and gain an excellent view of a waterfalls on Trapper Creek. At the bottom of all this descending you will come to a substantial bridge which crosses the creek and gets you on your way down the valley paralleling the creek as you go, but well above it to the point you don't see it. After another mile or so of hiking you will come to an alternate route. This is Trail #192A. Either way gets you back to the same place as the alternate route reconnects with the original trail in about a half mile. Ever since you crossed Trapper Creek you will walk amongst the giants. The Old Growth forest provides some amazing specimens for your enjoyment. Continuing on Trail #192 you will eventually return to the junction of Trail #132 where you left this trail earlier. Just continue on #192 to the trail head where you began this hike. Continue straight ahead on Forest Road 3065. After crossing the Wind River you will come to the junction of Forest Road 5401. Turn right onto FR5401 and cross Trapper Creek and drive a short distance to the parking area and trailhead for this hike.